Info "Open the egg and see what's inside!" 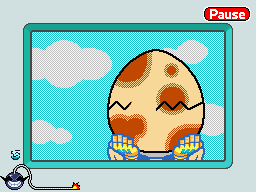 Eggstraction is one of The Job Center microgames in WarioWare: D.I.Y. The player has to draw the entity that comes out of the egg when it is cracked. The name of the game is a play on the words "egg" and "extraction". To win the game, the player has to tap the egg several times to make it crack. If this is done, a chick (in the original game) comes out of the egg. If the time's up and the egg hasn't been hatched yet, the player loses. "I'm gonna be holding a big egg in this one. You need to figure out what's inside the egg." This page was last edited on July 17, 2018, at 21:15.